You may not realize it, but a healthy smile can go a long way in securing a successful career. Regardless of the type of work you do, maintaining your teeth and gums can even be the difference between getting a promotion or being stuck in a rut. Anyone in sales will tell you the importance of a winning smile. When your job dictates close, face-to-face contact with potential clients, certain aspects of your smile really need to shine. of your tongue, the pockets in your gums, even your tonsils. Good hygiene is the first line of defense. Make sure you’re brushing a minimum of twice a day, sneak in that lunch time brushing if you can. Don’t neglect your tongue! A large number of odor causing bacteria reside on the back of the tongue, you can brush your tongue with your regular toothbrush, or if you feel like you’re going to gag, you can buy a tongue scraper that will thoroughly clean your tongue with less discomfort. Flossing also is essential, as the pockets between your teeth are holding particles of food and bacteria. Finally, some people have deep crypts in their tonsils, these hidden areas can hold food and bacteria as well, although they are harder to clean, and may require professional attention from a dentist or an ear/nose/throat doctor. Besides odor, minor cosmetic issues can make a huge difference in a career. Have you ever thought someone has a nice smile only to notice one little eye sore that caught your attention? Maybe a chipped tooth, a black spot, or a crown with a gray line at the top. These seemingly minor tooth problems become the center of attention when a person smiles. When giving an important presentation at work, the last thing you want people to look at is your teeth! Most of the time these problems are very easy to correct. Chipped teeth can be corrected typically in one visit with a composite bonding material. A black spot is usually a sign of decay, and can be corrected with a filling. Older crowns made from older materials like base metals or gold can be replaced with all-porcelain materials to achieve a more natural look. Many people don’t realize how much teeth affect speech. Problems with your front teeth can affect your F and V sounds as well as create lisping or whistling. These all are distractions that no one wants to deal with in a close work environment. Oftentimes, people assume replacing missing teeth will be painful or expensive, so they avoid even consulting their dentist on the issue. I have many patients who tell me they feel just fine without their teeth and they’ve lived without them for years. I always do my best to advise these patients on how much their quality of life will be affected by replacing their missing teeth. idea. When the work is done, patients are always surprised at how much the new teeth have affected their daily life. 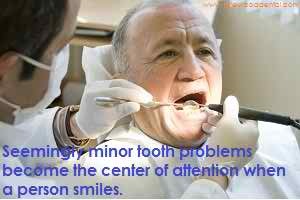 a moment to assess your smile and see if there are any issues that could use a little attention. Schedule with your dentist, talk to them openly about your concerns and come up with a plan to eliminate any trouble spots. If you’re comfortable with your smile, your confidence will show through. And that can mean the difference between succeeding in life or falling short of your aspirations. Dr. Mohajir is a member of the American Dental Association, Illinois State Dental Society, Chicago Dental Society and is a Fellow of the American Dental Society.